This page describes the changes made to UniPlot R2013 since UniPlot version R2012. In some rare cases, an error in UniPlot versions R2012.0 to R2013.11 lead to data loss in IPZ files and NC2 files, see Error ID3668. If this error occurred in the past, you should install the update R2013.12 or add the .jnl files to the exclusion list of your virus scanner. (ID3748): Data=>3D-Dataset=>Z-Values: The field functions were not updated after closing the dialog box. For example, the color legend was not updated. To force an update of all field functions, press F9. (ID3753): DocSetPathName: Did not set the file name correctly. (ID3755): TableDeleteColumn and TableDeleteRow: The settings for the edge line got lost, if the first column or row was deleted. (ID3756): Calculated datasets, for example a difference map or a mean curve, was not set to “0”, if one the the datasets used for the calculation had only invalid data or contained 0-data points. (ID3758): Data=>Data Exchange (Page): The hidden setting for 3D-datasets got lost during data exchange. New AddIn, see Import of ATFX Files (beta version). Map Calculator: The map can be saved as a DAMOS file. Fixed bugs, see Bug Fixes R2013. New/modified UniScript functions, see UniScript R2013. Import of KiBox Files: Calculation of average cycles added. Formula Interpreter: So far the formulas were calculated without taking the channel units into account. The formula Power = (speed * torque) / 9549.3 only delivered the correct result if speed was measured in rpm and torque in Nm. The new option to calculate the formula in SI units has been added: Power = (speed * torque) * (2*PI). In this formula speed will be converted to 1/s and torque to Nm. Power will be converted to the specified unit, e.g. kW. See also Units, Formula Table, ch, set_ch. Formula Interpreter: Placeholders for numeric values in channel names have been added. Example: pcyl_<c> == A_<c> * 7.82 will create the channels pcyl_1 to pcyl_4, if the channels A_1 to A_4 are existing. See Formula Table. 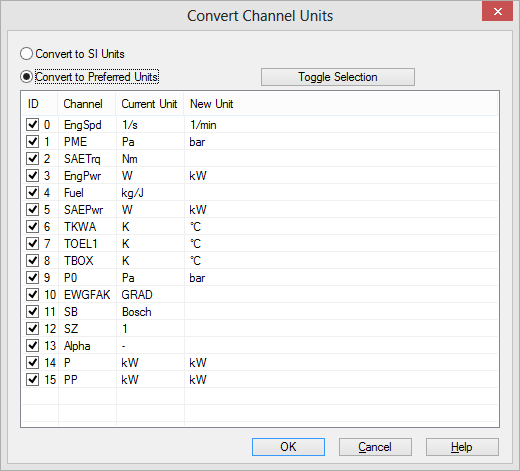 Units Converter: A third sheet has been added to the units definition file (see Unit Converter) to define the common unit for channels. Browser=>Convert Units: New function to convert units in NC files. The document to describe the creation of UniPlot data files from high-level programming languages has been improved (see netCDF-SDK). Power = (n_Motor * Md_Motor) ..
Browser=>Add Files: Improved function to concatenate NC files with multiple time groups. The new function can add NC files created from MDF files. The bitwise operations in UniScript use signed 32 bit integers. To access the bits from bit 32 to 64 a new set of bit functions have been added (see bit_set etc.). The zip functions in UniScript (zip_zip etc.) could not be used for archives with password protection. A new set of functions (see p7z_zip) based on 7zip (http://www.7zip.org) has been added to read and write password protected archives. New and modified UniScript functions, see UniScript R2013. Improved logging for bug tracking, see Overview Logging. Right click on the page tab to change the tab color. 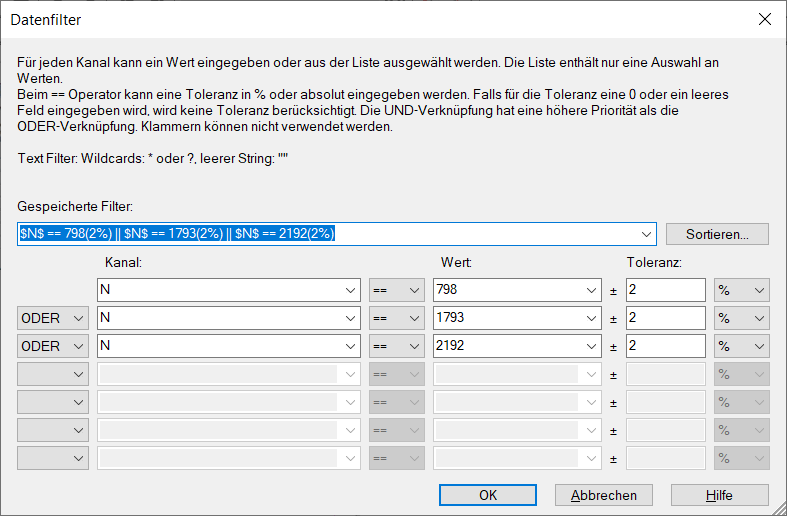 MDF Files (INCA), Dialog Box=>Data Filter: So far, for NC files with multiple time groups (dimensions), it was not possible to define a record filter. To work around this problem all channels could be interpolated onto one time resolution before the filter was specified. 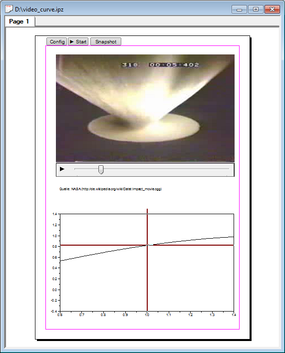 Now a record filter can be defined for MDF, BLF, or Puma recorder data without the interpolation. The filter can use channels from different time groups. The channels will be interpolated to the time resolution of the first channel. The filter channel is saved in the time group of the first channel in the filter. For all other time groups the filter will be calculated on demand. Valid range is between 2e6 and 32e6. See also Processing Large Data Files. The setup program in R2013.3 has been split in a setup program for the 32-Bit version and the 64-Bit version, see Installation of UniPlot. New UniScript function to play video in a UniPlot document, see Edit=>Insert Video, Edit=>Object Properties=>Video, VideoCreate, VideoCommand. Dialog Box=>Data Filter: A record filter can be specified using text channels. The filter can contain the wild cards * for zero or more characters and ? for exactly one character. Export=>Send to Word: Dialog to select pages added. New or modified UniScript functions, see UniScript R2013. The zlib library has been updated to version 1.2.7 (from 1.2.3), http://www.zlib.net/). UniPlot uses the zlib library to read and write XLSX, IPZ, HDF5, BMZ and MATLAB files. (ID3482): sort: Instead of the quicksort algorithm the function now uses the merge sort algorithm. It is a stable sort, which means the algorithm preserves the input order of equal elements in the sorted output. Internet: The download page only lists the executable setup programs. The ZIP files have been removed. See http://www.uniplot.com/download.html. Some Internet Browser displayed warnings if a ZIP file was downloaded. The editor window can be split horizontally or vertically using the Ctrl-F7 hot key. The command can also be accessed over the View menu. By default, UniPlot R2013 will be installed in Uniplot Software\R2013 in the program folder. It can be installed and used parallelly with R2012. Version R2013 contains only small modifications. New features will be added in the next updates. Peak Detection: New function to find local minima and maxima (peaks and valleys) in a noisy signal. Data=>Find Peaks. PowerPoint-Export: Page name can be used to display in the Outline tab. See File=>Send to PowerPoint. Gas Response Time Correction: New addin to shift signals in time to compensate Gas Response Times. The possibility to translate the UniPlot-User-Interface into other languages has been improved, see _s. SQLite3 has been updated to version 3.7.15.2 (see http://sqlite.org). The library will be loaded during startup. A call of loadlib(“rs_sqlite3.dll”) is not neccessary any longer. New and modified UniScript functions: See UniScript R2013.